Star Wars: Dawn of the Jedi Vol. 2: Prisoner of Bogan has a lot to recommend for it. The writer is John Ostrander, long-time Star Wars comics scribe and also writer of such much-beloved series as Suicide Squad, Spectre, and Martian Manhunter. Art is by Jan Duursema, an equally established presence in Star Wars comics. And at least in the review copy I read, Bogan did not have covers breaking the issues into "chapters," nor was there the common splash page every twenty-or-so pages, such that indeed Bogan reads like a graphic novel. All of this stands in Bogan's favor. But even as the Dawn of the Jedi "series" is a collection of miniseries rather than a true ongoing series, Prisoner of Bogan is considerably steeped in the events in Force Storm, the story that came before it; this is no fault of the creators, who have a right to link their miniseries, but rather a caution that anyone moved to check out Dawn of the Jedi ought start with Force Storm and not with Bogan. I understood the story well enough by the end, and there's significant, comprehensive recapping of Force Storm provided, but Bogan was not a standalone book as I had thought, and it takes significant concentration and re-reading to understand who's who if you start with Bogan. At the same time, whereas the last "expanded universe" Star Wars title I read, Lost Tribe of the Sith: Spiral was set 3,000 years before the Battle of Yavin in Star Wars: A New Hope, Bogan is set more than 25,000 (!) years before A New Hope -- and yet I found Bogan perhaps a little easier to understand in terms of where it fit in with the Star Wars universe. 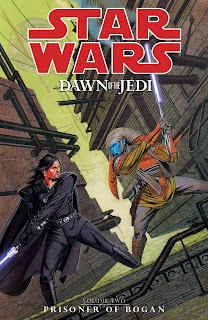 The Jedi are referred to as Je'daii and "Sith" hasn't made the vocabulary yet, but the Force is present as are nascent lightsabers, and a good part of the book takes place in a Je'daii academy that's not far removed from what one would see in the Clone Wars cartoon, etc. Bogan, still despite that it takes place so much earlier than Spiral, also has more of a science-fiction bent than John Jackson Miller's Spiral did. The planet of Spiral's main focus specifically lacked space-fairing vehicles, and there were dragons and such that made Spiral feel fantastical; Bogan is more what I'd traditionally expect from Star Wars -- planet-hopping starships, an occasional "hive of scum and villainy," and so on. How exactly the Star Wars universe can have starships no better and no worse than those in the Star Wars movies 25,000 years before the fact, I can't quite figure, but the result is that the broader strokes of Bogan should feel familiar to general Star Wars fans. For a book called "Prisoner of Bogan," little of the book actually takes place on Bogan. The story largely involves a Fugitive-esque chase as mad Je'daii Daegen Lok and former slave "Force Hound" Xesh escape the Bogan prison planet and try to make true Lok's vision of a Je'daii war, while a team of Je'daii and apprentices try to catch them. The story isn't terribly more complicated than that, but Ostrander (in what I like to think is "Suicide Squad fashion") gives each of the Je'daii fairly distinct personalities, and there's a nice series of fights and near misses, especially toward the middle when the Je'daii seem to lose one of their own. What may be best about Bogan, however, is what Ostrander sets up for the next book. The Je'daii declared Nok mad mainly because they were too unnerved to accept the truth of his vision of war; Nok ventures to find the remnants of defeated Queen Hadiya's army, such to attack the Je'daii. Neither the Je'daii nor Xesh know, however, that Xesh's forgotten brood mate Trill has infiltrated the Je'daii, and plans to lead the conquering Rakata to them. As such, while Dawn of the Jedi at times seems to be heading toward the "usual" conflict between the light and dark sides of the force, in fact it seems both will need to team up against their greater enemy. The teaming of Jedi and Sith is something done well previously in Clone Wars and elsewhere, and it makes me eager to see how things resolve (or continue) in the next book. 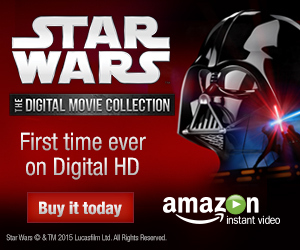 John Ostrander and Jan Duursema's Star Wars: Dawn of the Jedi Vol. 2: Prisoner of Bogan is not the place where you should start the Dawn of the Jedi series, but certainly it's not a bad read when you get to it. I would say I liked it better than Lost Tribe of the Sith: Spiral; even as Bogan is set an incomprehensible time in the past, it resembled for me more what I expect from a "traditional" Star Wars story.